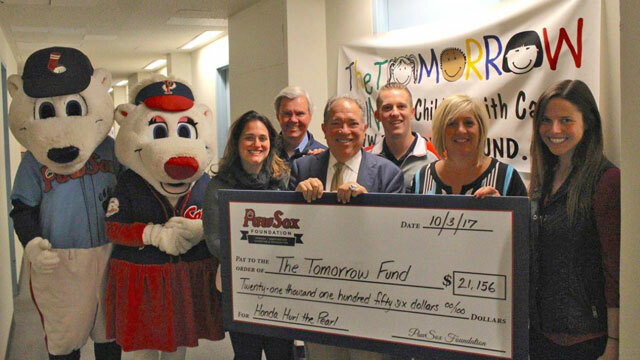 The PawSox on Tuesday presented the Tomorrow Fund with a check for $21,156 representing the proceeds from their "Hurl the Pearl" program that occurred between innings during each PawSox home game at McCoy this past season. Joining the presentation (left to right): mascots Paws and Sox, PawSox staff members Julie Hershkowitz, Mike Lyons, PawSox President Dr. Charles Steinberg, Joe Bradlee, Executive Director of the Tomorrow Fund Lisa Abbenante, and Jackie Dempsey. The PawSox Foundation today presented $21,156 to the Tomorrow Fund at Hasbro Children's Hospital in Providence, RI, to help families of children who are battling cancer. The funds are generated at the PawSox' nightly "Hurl the Pearl" contest presented by six local Honda dealers. "Childhood Cancer is one of the primary areas of focus of the PawSox Foundation," said PawSox President Dr. Charles Steinberg. "We are inspired by the great work and good deeds of the Tomorrow Fund, and we are pleased to help their efforts. Talking to the families who have benefited from their care, we recognize what a treasure Rhode Island has in the Tomorrow Fund." Tomorrow Fund Executive Director Lisa Abbenante received the donation from a PawSox contingent that included Steinberg, as well as Julie Hershkowitz (Director of Client Services), Mike Lyons (Account Executive, Partnerships) Joe Bradlee (Director of Communications & Community Relations), Jackie Dempsey (Special Assistant to the President), and team mascots Paws and Sox. Last year, fans raised $10,008 for the charity. The local Honda Dealers who sponsor the promotion (and provide the decorated vehicle) are Balise Honda, Grieco Honda, Herb Chambers Honda, Majestic Honda, Saccucci Honda, and Colonial Honda of Dartmouth. For the second straight year, the PawSox helped launch Childhood Cancer Awareness Month (September) in their final weekend of the season.